We are pleased to announce the results of our January 2016 survey to assess the impact of the Super Bowl on worker absences the next day. According to the study, 77 percent of American workers plan to watch Super Bowl 50. The results suggest that one in 10 U.S. workers, or an estimated 16.5 million employed U.S. adults may miss work the day after Super Bowl 50 due to the game, with nearly 10.5 million Americans having already requested or plan to request the day off in advance. In addition to those who won’t show at all, another estimated 7.5 million Americans say they may show up late to work Super Bowl Monday. Super Bowl-related absences could be particularly striking for organizations with a high population of Millennial and Gen Z employees, as 20 percent of employees ages 18-34 say they may not go to work on Monday because of game. Of those who plan to watch Super Bowl 50, 32 percent of men ages 18-34 and 20 percent of men ages 35-44 claim they might not go to work the following day due to the game. And men are not the only ones at risk to catch Super Bowl Fever: 10 percent of employed women who plan to watch the big game say they might not go to work on Monday. Carolina Panthers and Denver Broncos fans could be most likely to request the day off in advance, as 43 percent of those who took off Super Bowl Monday as a planned absence in the past say they did so because their favorite team was playing in the game. Those who plan on attending a Super Bowl party are also likely to request Monday off in advance, as 43 percent cite this as a main reason for taking a pre-approved day off. Simply being tired from staying up late watching the game was the top reason for both calling in sick (40 percent) and showing up late (41 percent) on Monday unannounced. One encouraging finding for leaders concerned about absenteeism is that 74 percent of full-time/part-time employed Americans claim that they would tell their boss the truth about why they missed or showed up late to work unexpectedly if a personal, non-essential activity such as watching the Super Bowl or attending a concert, sporting event, or party caused them to miss work or come in late the following day. What about you? Are you feeling the Super Bowl Flu coming on? Should Super Bowl Monday be a Holiday? 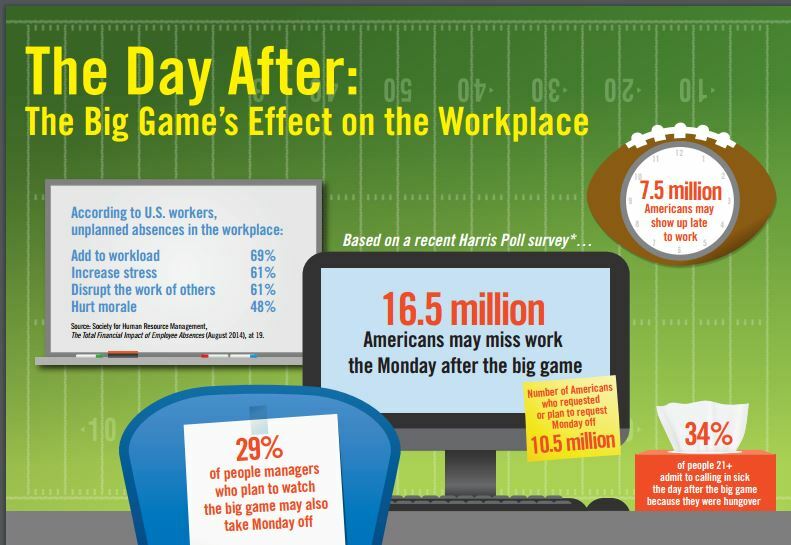 Will Your Workplace Be Ready for the Big Game? No “Super Bowl Flu” at our company. Monday is a mandatory work day and if someone doesn’t come in they need to have documentation as to why otherwise they are subject to disciplinary action. There are millions of people out of work and many of them would gladly take the job from someone too irresponsible to control their drinking due to a sporting event. It’s all a matter of priorities. Fans of the Panthers and Broncos were the most likely to request that Monday off in advance as are people who are attending a Super Bowl party.